THE KISS...... - The Elf Kingdom (TEK). When he finally got done putting the fire out, he sat down to catch his breath and rest. 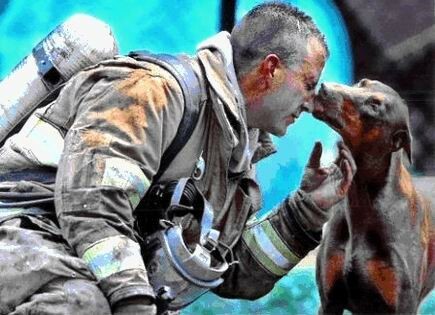 A photographer from the Charlotte, North Carolina newspaper,”The Observer,” noticed this red Doberman in the distance looking at the fireman. He saw her walking straight toward the fireman and wondered what she was going to do. As he raised his camera, she came up to the tired man who had saved her life and the lives of her babies, and kissed him, just as the photographer snapped this photograph.